Kitchen design in general appears to be moving toward clean and simple lines, which is reflected by the growth in popularity of contemporary kitchen designs and the continuing prominence of transitional styles. This is according the National Kitchen and Bath Association’s (NKBA) 2014 Design Trends Survey for Kitchens, which also predicts a trend toward easy to maintain kitchens and great storage solutions to support better organization in the kitchen. Steam ovens and induction cooktops, and more! Were these design ideas enough to inspire you to dream about your next kitchen renovation project? Here are two other clever trends that might really cause you to rethink your kitchen design. For so many of us today, electronic devices are an integral part of our everyday life. Our phones are no longer just for making phone calls; we use them to store all of our everyday data including shopping lists, schedules, and reminders. Tablets and laptops follow us around the house and are used to access information necessary for all aspects of day-to-day living. Many of us are now more likely to search online for the perfect recipe rather than reach for our cookbooks. We no longer only watch television, we watch Netflix or use Apple TV and have our electronic devices linked together throughout our house. So why should this integration stop at the kitchen door? The answer is it does not need to stop there, and electronics are increasingly incorporated into kitchen design. 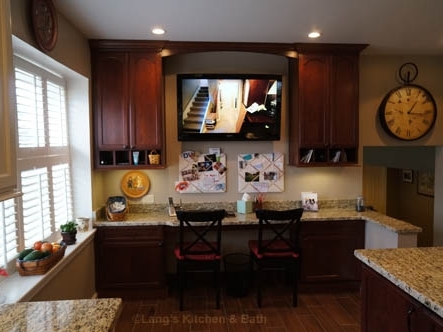 Many homeowners are including flat screen TVs in their kitchen remodeling projects (as pictured below), as well as integrated docking stations, charging stations and more. Kitchen design with integrated desk and flat screen television. Remember that great YouTube video showing you how to make the perfect cake pops? Now picture using your Apple TV or other connection to watch it on your flat screen TV in your kitchen while you bake. Imagine having the perfect set-up for all of your electronic devices in your kitchen, where you no longer have charging cables stretched across your countertops. This could be accomplished by designating an area of the kitchen for electronics or even by incorporating a desk into your kitchen design, as was done in this kitchen. Another interesting trend in kitchen design is to include a purpose-built area for the furry members of the family. Pet stations in the kitchen that are specially designed for needs of pets are becoming increasingly popular. This could incorporate an area for food bowls so you no longer have to trip over the dog’s water bowl, an area to store pet food or other supplies, built-in pet beds, or even a litter box cabinet. Not only is this a nice thing to do for your animal family, it can really help the organization of your kitchen so you are not struggling to find the right space for all of your pet’s requirements. Today’s kitchen can be designed to meet all the needs of your household, and goes far beyond just selecting the right cabinet finish and appliances. Visit our kitchen design gallery for inspiration, or contact your kitchen design professional for more advice on how to create your ideal kitchen design today!